A low pressure system passing through the Pacific Northwest has caused the winds to shift back to the southwest and increase overnight. These winds should continue to gain speed and intensity today. This low pressure should also bring an increase in cloud cover to the forecast area. By late tonight the system should have moved far enough to east that both the winds and cloud cover should start to decrease leaving light winds and clearer skies for Saturday. The top 1 to 3 inches of surface snow softened by noon yesterday on the southerly aspects in the Mt. Reba area (near Bear Valley) and in the Blue Lakes area (near Carson Pass). This softening created excellent spring corn conditions on these aspects. Observations this week indicate that these spring corn conditions exist on most of the southerly aspects across the forecast area. The snow surfaces that softened yesterday should have undergone a solid refreeze last night due to radiational cooling and below freezing air temperatures. A melt-freeze crust exists on all the other aspects as well. This crust remained frozen on the northerly aspects yesterday. In some areas, shallow pockets of unconsolidated snow sit on top of this melt-freeze crust. The warm air and sunny skies will quickly change this snow into melt/freeze snow and assimilate it into the snowpack. Recent snowpit data indicates that the deeper snowpack consists of dense layers that are well bonded to one another on all aspects and at all elevations. Today, warmer air temperatures and solar radiation will melt snow in sun exposed areas at all elevations. The greatest amount of melting will occur on E-SE-S-SW-W aspects. Well formed melt water pathways, a solid overnight refreeze, and an increase in cloud cover should all help to limit the soft, wet snow to the top few inches of the snowpack. Any areas of wet snow instability that form today are not expected to present a significant hazard to backcountry travelers. Natural and human triggered avalanches remain unlikely at this time. The bottom line: Avalanche danger is LOW for all elevations and aspects. Normal caution is advised. Max. 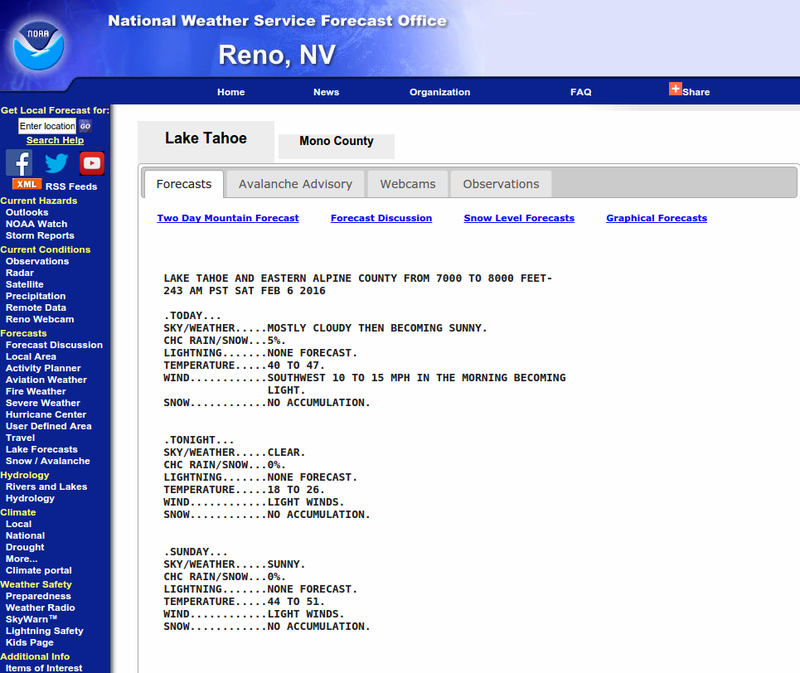 temperature at Sierra Crest past 24 hours: 45 deg. F.
Partly cloudy with more clouds developing this evening. Ridgetop winds forecast for the Sierra Crest: Southwest at 15 to 25 mph with gusts to 40 mph increasing to 30 to 40 mph with gusts to 60 mph. Today, partly cloudy skies with daytime highs 42 to 52 deg. F. South winds at 10 mph shifting to the southwest and increasing to 15 to 25 mph with gusts to 40 mph. Tonight, mostly cloudy skies in the evening then some clearing after midnight. Overnight lows 25 to 33 deg. F. Southwest winds at 15 to 25 mph with gusts to 45 mph decreasing to 10 to 15 mph with gusts to 30 mph after midnight. For Saturday, partly cloudy with daytime highs 40 to 50 deg. F. Southwest winds at 10 to 15 mph. Today, partly cloudy skies with daytime highs 34 to 44 deg. F. Southwest winds at 15 to 25 mph with gusts to 40 mph increasing to 30 to 40 mph with gusts to 60 mph. Tonight, mostly cloudy skies in the evening then some clearing after midnight. Overnight lows 21 to 31 deg. F. Southwest winds at 25 to 40 mph with gusts to 65 mph. For Saturday, partly cloudy with daytime highs 32 to 42 deg. F. Southwest winds at 10 to 15 mph with gusts to 30 mph.